Middle-aged adults are natural risk takers and, on average, they prefer equities over bonds as they save for their retirement. Meanwhile, senior citizens make no positive contribution to equity market returns. In their 60s, they disinvest to buy bonds, following which they buy goods and services that they no longer produce. 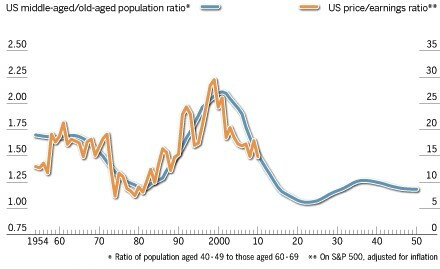 The effect from ageing can be measured on P/E ratios with equity valuations in the United States peaking at about the same time as the ratio between middle-aged and old-aged people did as the chart (1) below shows. Source: “The population conundrum”, Financial Times, November 2012. 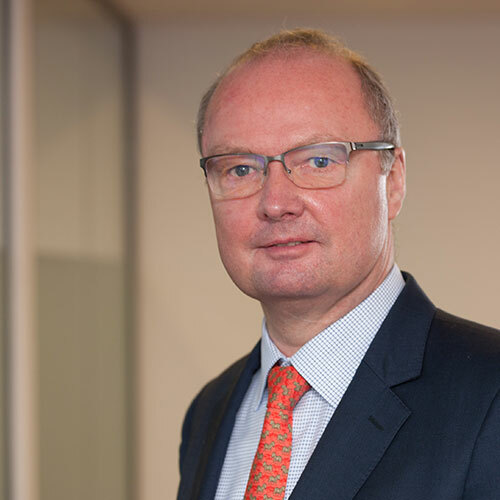 In 2012, Robert Arnott and Denis Chaves published a study, which I believe to be the largest ever conducted on the effect on economic growth, stock and bond market returns from changes in age distribution. Arnott and Chaves used 60 years of data across more than 100 countries in their study. The objective was to assess whether changes in the age composition of the population has a significant effect on capital market returns and/or on economic growth. Returns were measured as excess returns over cash in order to adjust for the fact that the risk-free rate of return is vastly different across markets and time. For the purpose of this I’ve concentrated on equity returns (chart 2). 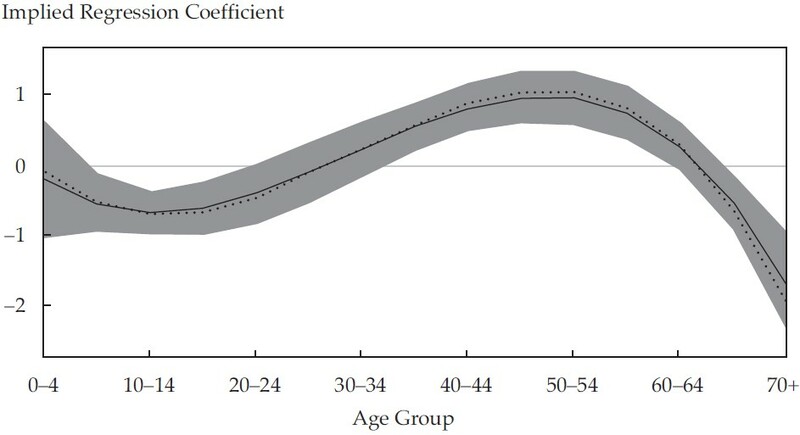 The chart peaks at around 1% for the 50-54 age cohort, meaning that a 1% higher concentration of 50-54 olds would lead to an increase in annual excess equity returns of approximately 1%. Likewise a 1% higher concentration of the 70+ age cohort would lead to a decrease in annual excess equity returns of about 2%. Demographic Changes, Financial Markets, and the Economy, Robert Arnott and Denis Chaves, Financial Analysts Journal, Volume 68 No. 1, 2012. Given the large number of boomers knocking on the 70+ door, you will ignore demographic factors at your own peril. We know that total U.S. household wealth is approx. $84 trillion. We also know that U.S. baby boomers own 60% of the nation’s wealth, so their impact on equity markets shouldn’t really come as a surprise. What has been a tailwind for many years is likely to turn into a sizeable headwind in the foreseeable future. The biggest equity buyers (the 40-49 year olds) are being outnumbered by the biggest bond buyers (the 60-69 year olds), pushing bond valuations up and equity valuations down. Importantly, that trend is likely to continue until at least the mid-2020s, which raises another question and one that I won’t attempt to answer right now. How much of the recent strength in various bond markets should actually be attributed to QE and how much is due to demographic factors? Nobody really knows the answer to that question, but I suspect that the significance of central bank policy has been overestimated. So, yes, demographics matter to equity market returns, as the Japanese have come to realise. It is no coincidence that the great equity bull market has coincided with the baby boomers going through their middle ages.